A dwarf, low growing, densely branched shrub with reddish-purple fall color. It does not fruit or flower. It prefesr a site in full sun or part shade, in a moist, well-drained soil. 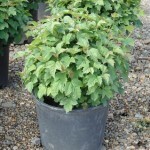 It makes an excellent low hedge, for mass planting, or in a shrub border. Requires little or no pruning to maintain its neat form.